Safety is our number one priority. We take our responsibility very seriously to provide a safe environment for hundreds of patients, visitors, and employees every day. We also take every opportunity to provide the most advanced equipment and staff education to continually improve patient safety, but there are ways you can help too. 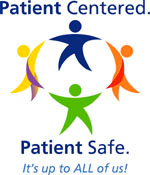 10 Patient Safety Commandments - What you can do to help.